Wayne Huang is co-founder and CEO at Xrex Inc. 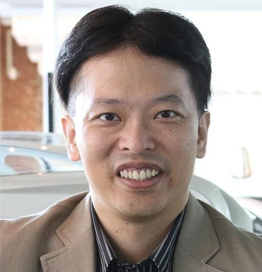 Prior to Xrex, Huang was Founder and CEO at Armorize Technologies and VP Engineering at Proofpoint (NASDAQ: PFPT). As both a cybersecurity expert and a crypto enthusiast, Huang is a frequent speaker at cyber security and blockchain conferences including BlockBeats 2018, Chain-in 2018, Blockchain Technology Conference 2018, Swiss Cyber Storm 2018, BlackHat APAC 2017, Troopers 2016, AusCERT 2016, Virus Bulletin 2016, SteelCon 2016, Hack.lu 2016, HackFest 2016, and many more. A diligent blogger on cyberthreats, his research has received worldwide media coverage, including Reuters, Forbes, IDG, USA Today, Wired, Dark Reading, The Register, The Hacker News, SC Magazine, eWeek, Threat Post, CSO, and Krebs on Security. Wayne received his PhD in EE from National Taiwan University, and his BS and MS in CS from NCTU. He holds two US patents on source code analysis.